This is the screen you get if you try to read the timeline of @EmpowerTexans. Without warning or knowingly violating any rules of Twitter their account shut down to tens of thousands of followers. Shockingly, INDIVIDUAL accounts of many of the key people were shut down as well. As ET mentions in their own article, Twitter routinely shuts down accounts, investigates reasonably quickly, and reinstates. As of today the only explanation they have received from Twitter is a "a vaguely worded auto-response-style message suggesting the suspension was due to unspecified violations of Twitter policies." 1. 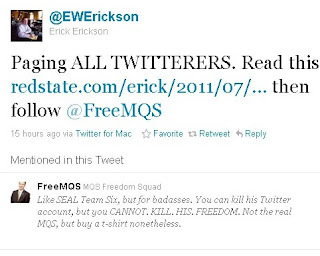 Erickson would not have tweeted this unless he felt it wasn't a casual mistake. Having just watched Glenn Beck's fabulous keynote to Christians United for Israel. I heard his voice in my head saying, "First they came for the communists and I wasn't a communist, so I did nothing..."
Point #2 glared at me. This could have been @melissatweets, or @NotleNC, or ME! If this was politically motivated - Twitter needed to feel pain and quickly. Erickson's, "PAGING ALL TWITTERERS" to me read, "THE BRITISH ARE COMING, THE BRITISH ARE COMING." (No, there were no other stimulants in my bloodstream but it was REALLY good coffee). I asked if anyone had any ideas. I didn't see any replies so I tapped into one particular caffeinated lobe for three of my own. First, we could boycott Twitter for a day. Another idea would be to launch an email/fax bombardment of Twitter offices by us conservative tweeters. And my last quickly conjured thought was to gather a petition, by Twitter handle and follwer numbers, with an accompanying threat to move to Google Plus if this is not immediately rectified. 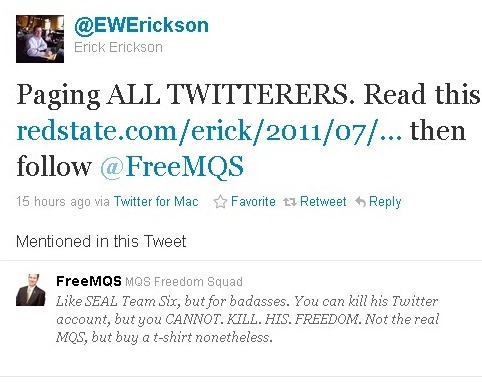 After a few minutes I saw only 3 or 4 people actually retweet the Erickson alert. I directed it to some of the biggest conservative tweeters in my timeline - most who continued their discussions of the latest twist in THE BACHELOR or whatever late night banter was the norm. My heart was sinking. Is this what we are? Our forefathers RAN to the aid of a nearby farm or town at the threat of their neighbors freedom - but a private company eliminates the voice to 20 thousand people without explanation (possibly because of their conservative views) and we aren't even TALKING about it?? Finally I got a reply from a major conservative Washington media player with 8000+ followers. Now we are cooking! TO ARMS! They would start the ball rolling! Their reply made me feel like William Wallace unmasking Robert the Bruce in his last battle. The tweet read something akin to "Well if Erickson is on it I'm sure he'll keep us up to date." All the 'writing' about it will do nothing. Especially if all of us assume someone else will 'take care of it.' That is a liberals MO right? Give a speech instead of taking action? ...but what if it was @DavidLimbaugh? What if it was @EWErickson or @Kesgardner? What if they pull this shenanigan right before a Senate vote on the debt ceiling, or God forbid, at the 11th hour before an election? It will be a little too late to get upset at that point. The manager and strategic planner in me jumped even farther. We could all migrate to Google Plus but we all know (at least in the conservative movement) the questionable political motives of their founders and evidences of collusion with the Administration. We know Obama has hired Marxists and those who openly expressed little appreciation for the constitutional heritage and rights of freedom. And more than a few eyebrows have been raised at Executive Order #10995 which allows the White House to take over ALL communications in an emergency. 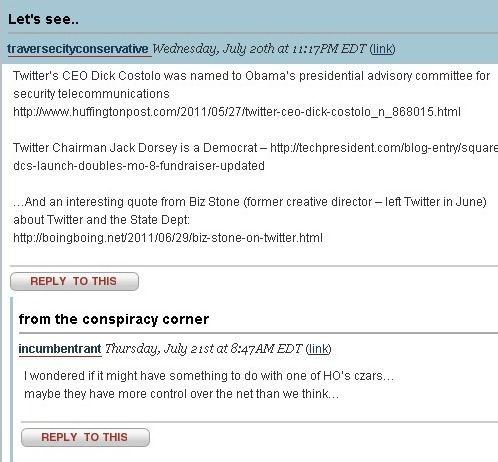 So am I saying that this is part of a plot to shut down conservatives on the Internet? If you had asked me before I learned that Black Panthers carrying weapons wouldn't be prosecuted for intimidating voters but that Border Patrol officers WOULD (for merely doing their jobs) - my answer would have been no. If you had asked me before I learned that Obama so no problem in intimidating a private business CEO, steal that company's equity from bond holders and investors while giving it to his union buddies all the while sending unauthorized Billions (with a B) of US money to foreign banks without any accountability - I would have said no. I agree Twitter has a right to do whatever they want with their company. I like Twitter. a lot. More than Facebook and more than Google Plus (so far at least). But as conservatives, I think we should be doing two things. One is to begin compiling our networks in multiple ways - including those that can't easily be shut down by the major social networks. We like the protections afforded us by places like Twitter. (I mean could you imagine letting HALF the people that read your tweets have your email? God help us). But whether it is a conservative held company like gracehope.com or another - we should have backup and quickly. The other is we HAVE to speak up on behalf of EmpowerTexans. All media - social or otherwise - have to see that we are unified. If they do it to one of us - they incur the consequence of ALL of us. I don't have the technical ability to orchestrate any of my three puny ideas even if any were any good. I guess we could start a petition at EmpowerTexans simply by leaving a comment on their article here. I wish I knew how to contact the Jay Sekulow's of the world to see if there was any litigation assistance necessary. Because I AM a conservative. I believe in the write to freely assemble and the right to free speech. I believe a lot of people died bloody deaths and gave their fortunes for that right for me. I believe that conservatives are not 'all talk,' but that we would all fiercely give whatever time or resources we have for one another if a violation was inflicted on us. Lord God please tell me I'm not wrong. Today has been a whirlwind, with Twitter re-instating us. We're still surveying the landscape, in terms of what happened and how, but it does appear Twitter was "used" -- that is, their flag and suspend system was somehow manipulated. They have not yet said that, but it looks that way to us. Many will say I should now change my name to Emily Latella. You know the SNL character played by Gilda Radner who would rant about a subject until finding out she misinterpreted the subject and would respond, "OH. I didn't understand.. Well... Never mind...."
I am not quite so willing to believe this would address the cancellation of INDIVIDUAL accounts (wouldn't it cancel ALL or none?) but the point to me still stands. We need backup and we need to be prepared to defend our brothers and sisters if ANYONE's rights are taken away. I will update this blog and know you can also follow the story at EmpowerTexans.org. ....we were very appreciative of the lengths folks went - tweeting, calling, etc etc. I didn't see any cowardice from anyone. Rather, a full frontal defense of us and our work. I think Twitter, in the end, responded to us and the people calling for the reinstatement. Our friends proved they can move fast to defend each other. I may be looking more like Gilda Radner, but am very encouraged by this. I STILL am discouraged by those who were conservative and did NOT pick up the cause at least with a RT or a comment of support. I realize there are a LOT of battles to fight. I also realize we would have ZERO energy if we were emotionally invested in more than a battle or two at a time. But if it turns out this was not a mechanical/technical glitch - I expect to see our TwitterVerse more engaged. And I STILL think it is a good idea to have a backup network that isn't controlled by liberal trolls. I do. Really. .....Ok. I'm done. I was able to find out ONE of the suspended individual's accounts was reinstated. Still no word that I know of regarding @EmpowerTexans twitter account.